With over 2,200 contactless payment terminals across the country, Tesco has become the largest contactless retailer in Ireland. The retailer completed the national roll out of contactless technology to all its 149 stores earlier this year, offering consumers the fastest transaction times. In fact, the average number of contactless Visa transactions is reaching over 330,000 every week. Philip Konopik, country manager, Ireland, Visa, praised Tesco for “enabling their customers to benefit from a faster and easier checkout experience. “That Tesco customers have been so quick to adapt to using contactless technology is a testament to the quality of Tesco’s implementation and in-store communication at the point of sale,” Konopik added. The increasing popularity of contactless technology among Tesco customers is in line with the rest of the Irish retail sector. According to Visa, over three million contactless transactions are made each week across Ireland, growing from a standing start just over two years ago. As a result, contactless now accounts for one in three of all face-to-face Visa payments. 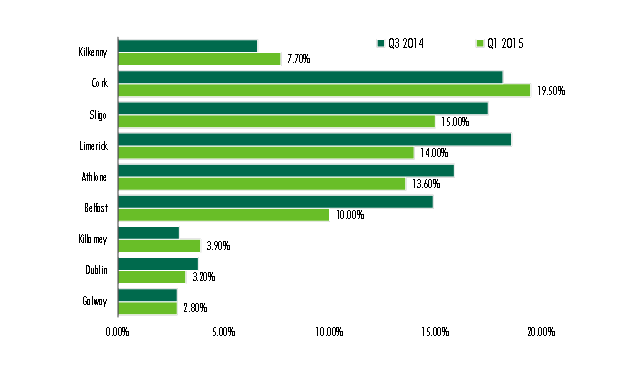 The increase in the contactless payment threshold from €15 to €30 has had a significant impact on the growth in popularity of contactless payments. A NUMBER of roles at McDonald’s Ireland corporate headquarters have been cut as part of a global cost-reduction, the Irish Independent has learned. The ‘Sunday Independent’ reported at the weekend that McDonald’s is scaling back its head-office operations in Ireland, with the business set to be managed from the UK. The managing director of the Irish business, Adrian Crean, is to leave the business this month and sources have said he will not be replaced. Other staff at the head office in Clonskeagh, Dublin, were notified of the risk of redundancy in March of this year, according to a source close to the matter. Through a series of redundancy consultation emails and meetings following the initial announcement, a number of employees were informed that their positions were “being removed from the structure”. 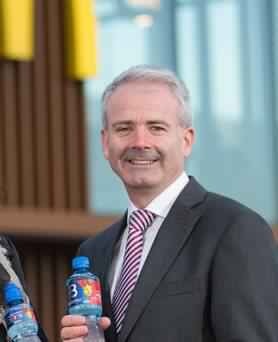 In an email sent on Friday, June 9, staff were told that McDonald’s Ireland MD Adrian Crean would be stepping down from the role on July 31 after a period of “gardening leave”. The source told the Irish Independent that the original team in the head office of around 40 – “most of whom had worked with McDonalds for 15-30 years” – was being reduced to just six. The senior staff were told that the changes to the Irish structure were originally put in motion in 2015 by CEO Steve Easterbrook, who had just taken over from Don Thompson. “He identified a plan to achieve returns (to ensure continued investor support)… and alongside it a reduction in the cost of running the McDonald’s global business. “A large part of these running costs is made up of salary costs. The source said staff were offered alternative vacancies “in the restaurants in Ireland” or ‘outplacements’, meaning jobs based in the UK. The affected employees are understood to be bound by confidentiality agreements that they are disinclined to break “or they will not receive their redundancy pay”. McDonald’s opened its first Irish store in Grafton Street in May 1977 and operates in 92 stores nationwide. McDonald’s Ireland said it was committed to its customers, franchisees and the 5,000 people who work in the restaurants across the country. “For over a decade, the Irish business has been part of the UK and Ireland business unit and we have recently made some operational changes to reflect that structure,” said a spokesperson. “In a planned restructuring, operations at the Dublin office are being scaled back. “We are currently in a consultation process with our employees and are not able to give specific details while the new corporate structure is being finalised. To celebrate the anniversary of brothers Thomas and Stuart Musgrave launching the business just over 140 years ago, Musgrave has unveiled a new brand identity. The company has revealed a new logo – a modified version of the Musgrave chairman in 1902’s signature – which will now rollout across the entire Musgrave business. 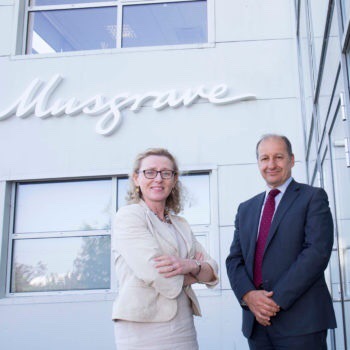 Commenting on the new brand identity, Musgrave CEO Chris Martin described it as “a symbol of Musgrave’s heritage and the pride we share in being a sixth-generation Irish family business”. He added that the new identity “will support our ethos of Growing Good Business as we continue to expand our retail, wholesale and export offering”. Musgrave’s brands comprise SuperValu, Centra, Daybreak and Marketplace. Together with its retail partners, the business employs over 35,000 people in the Republic of Ireland alone – making it the State’s largest private sector employer. Musgrave’s Growing Good Business strategy has also seen the company explore new opportunities, including the rollout of Frank & Honest, its new artisan take away coffee brand which has been launched in SuperValu and Centra. The strategy has also encompassed the development of a food emporium at its Musgrave Marketplace in two locations in Dublin; the launch of Chipmongers, it’s new foodservice franchise; and export to China through a partnership with Alibaba which has seen Musgrave start to export SuperValu products. “Food retail is our core business and we are focused on strengthening the leadership position of our brands through our food leadership agenda, through investing in digital and by building on the foundation of our success,” Martin added. 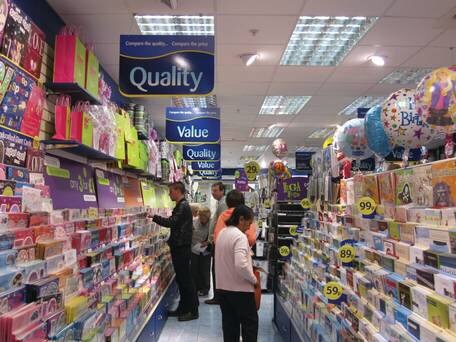 UK high street retailer the Card Factory is gearing up for its entry to the Irish market, three years after it first floated a plan to open as many as 100 outlets here. New CEO Karen Hubbard, who has been in the role for just a year, has told investors that she intends to pursue a strategy of expanding in Ireland and that there is a “clear opportunity” to build a strong presence here. The retailer has just established a company in Ireland to spearhead the expansion. Over the next three years, Card Factory plans to open a total of about 50 stores a year. At the beginning of February 2016, it had 814 outlets across the UK, including a handful in the North, a figure that had risen to 865 at the end of last January. Listed on the stock market, Card Factory posted revenue of £398.2m (€473.2m) in its last financial year, with like-for-like increases of under 1pc. Its earnings before interest, tax, depreciation and amortisation (ebitda) was £98.5m (€117m), which was 3.8pc higher on the previous financial year. Its margin slipped slightly from 24.9pc to 24.7pc. 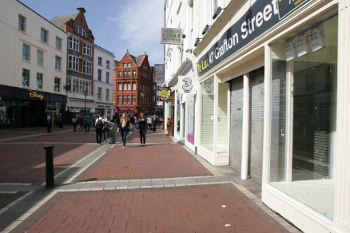 The profits fell as footfall to its stores declined. But apart from paying a regular dividend, it also paid a special dividend to shareholders. It is a strong cash generator and has only a small amount of debt on its books. The company floated on the stock market in May 2014, in an initial public offering that was widely seen as unsuccessful at the time. But its market capitalisation has risen from £712m in 2014 to the current £1.1bn (€1.3bn). Card Factory recently hired Edinburgh Woollen Mills finance boss Kristian Lee as its chief financial officer. 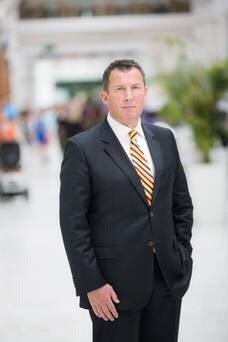 Interview: Denis O’Connell, Centre Director, Liffey Valley SC Denis O’Connell has been with Liffey Valley Shopping Centre since it was a plan on paper. He’s seen the highs of the boom and depths of the recession – when many retailers struggled just to make the rent. But he tells John Mulligan that despite a generally tough Christmas, the centre has been doing well, helped by a huge new Penneys store. It’s hard to imagine global mixed martial arts star Conor McGregor wandering about the Liffey Valley shopping centre and plonking himself down to have a coffee at Costa. 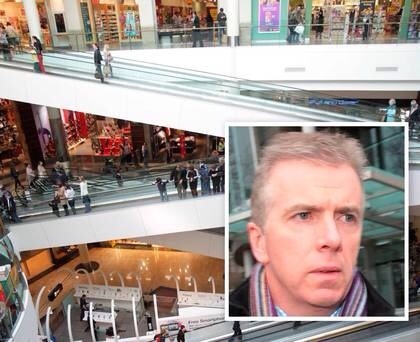 “You’d see him in Nando’s sometimes, having a bite to eat with his friends,” says Denis O’Connell, the director of the west Dublin shopping venue. McGregor’s parents live in nearby Lucan. O’Connell says that when McGregor became really famous, he’d always take time out to let kids take selfies with him. “I haven’t seen him here in about six months though,” says O’Connell, sounding a bit disappointed. Maybe he could take on McGregor as a brand ambassador? O’Connell isn’t too sure about that idea. At any rate, the time is past. McGregor might have been got for a steal a few years ago. Now he would break the bank. O’Connell (48) has been working at the Liffey Valley centre – the third-biggest in the country after Dundrum and Blanchardstown, also both in the capital – since before it opened in 1998, he was brought on board as construction got under way. Within 18 months or so of it opening its doors, he became the centre director – a role he’s had ever since. Controversy hung over the centre’s early years. The original planning for the site was the subject of intense interest at the Mahon Tribunal. As we sat down to talk, news had just filtered through that Owen O’Callaghan – the original developer of Liffey Valley – had died the night before. Today, with about 100 outlets and footfall of 8.6 million last year, the centre is owned by Germany’s largest public pensions group, Bayersche Versorgungskammer (BVK), for €630m, who bought the property last year. It was sold by one of the original developers, Grosvenor, as well as US property giant Hines and a unit of HSBC. 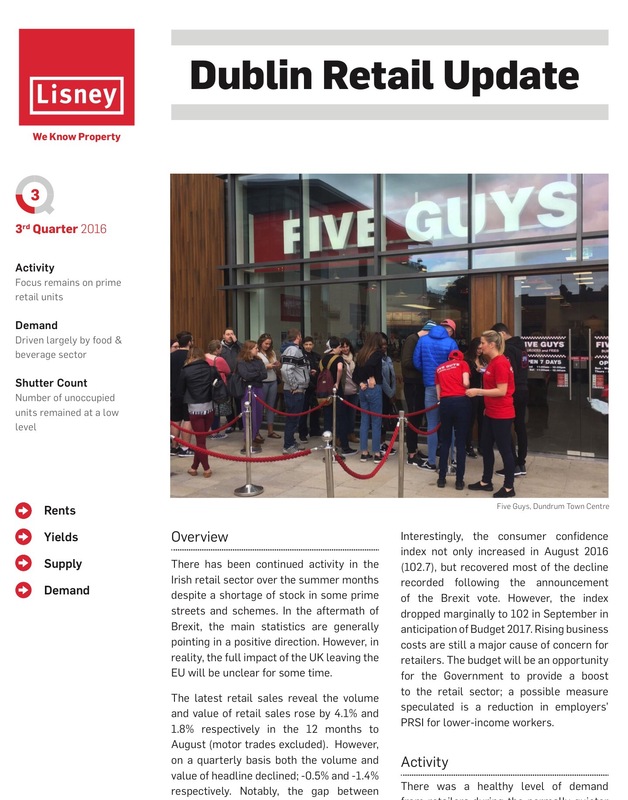 Hines and the HSBC unit had acquired a combined 73pc stake in Liffey Valley in 2014 from Aviva Investors for €250m, making for a stellar return on their investment. The centre had been put up for sale in 2011 for €350m, but had failed to sell. A sale was close at the time, says O’Connell, but just couldn’t get past the post. But they were dark times. The country was enduring a financial, social and economic implosion. O’Connell almost shudders when he recalls it. Men’s fashion was worst hit. The recession also saw the advent of new leases, with a 2009 act having banned any new upward-only rent reviews in leases. About 17pc of tenants at Liffey Valley are on such new leases and that first batch is now coming up for rent review. Most will probably face single-digit percentage increases. Liffey Valley’s annual rent roll is between €30m and €35m. It had been closer to €40m during the boom. The centre – with a catchment of about 1.7 million people within a 30-minute drive – is anchored by Marks & Spencer and Dunnes Stores, with most of the usual suspects renting the other units. Liffey Valley is also home to the busiest cinema complex in the country – the 14-screen Vue. “The best thing to come out of the recession in my view – it may sound like a cliche – is that there’s a lot more of a partnership approach between landlords and tenants, certainly here,” O’Connell says. Interestingly, he says that while men’s fashion was worst hit during the recession, sales of formal wear have picked up since the recovery began. 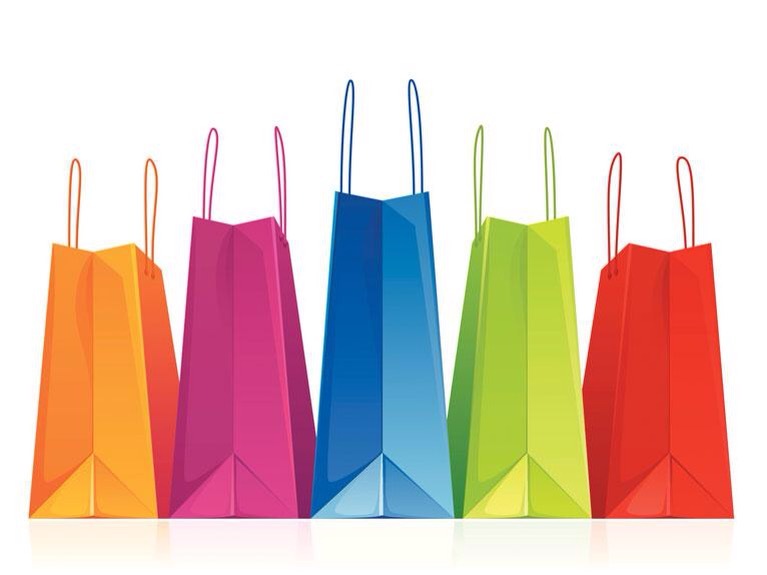 According to the latest available data from the Central Statistics Office (CSO), the value of retail sales, excluding motor sales, rose 1.8pc in November, and 2.2pc on an annual basis. The volume of retail sales, excluding motors, was up 0.6pc and 2.1pc respectively on that basis. Industry group Retail Excellence Ireland sounded warnings just a couple of days before Christmas that the festive season had been “challenging” and on par with 2015. Online sales had soared as shoppers took advantage of weak sterling, while telecoms, ladieswear, jewellery and footwear sales were “significantly down”, it said. O’Connell, who worked in his father’s pharmacy as a youngster in Tullamore, says he would track REI’s assessment before the CSO’s, because REI is closer to retailers on the ground. But despite REI’s gloomy report, O’Connell says that Christmas trading at Liffey Valley was pretty good, with a “very strong end” to the year. 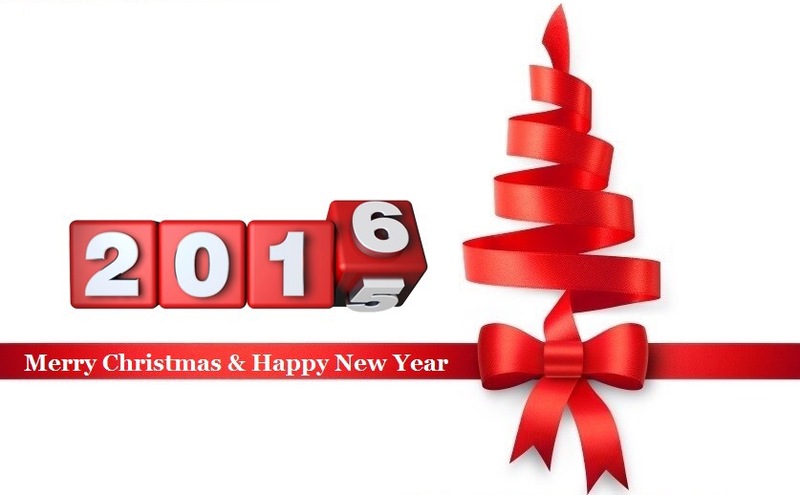 Footfall to the centre in December touched just under 1.4 million – a 16pc increase on December 2015. Its sales of giftcards (a card that can be used in any store in the centre), jumped 17pc in December to €1.6m. Full-year sales of those giftcards were up about 13pc, at €3m. “Things were tough coming into the last quarter,” he says, with things “improving slowly”. He blames higher rents and soaring new car sales for having “sucked the money” out of retail. New car sales hit their highest level in eight years in 2016, rising 17.4p on 2015 to 146,385. Residential rents rose by almost 4pc in the third quarter of 2016, according to most recent report from Daft, making for an 11.7pc annual rate of rent inflation across the country – the highest recorded by Daft since it began compiling rent reports in 2002. “Rent increases are taking disposable income away from retail,” he says. “Within our catchment area rents have increased and there’s been virtually no housebuilding. So, people who are renting have no option but to pay more. Something has to give. “The increase in new car sales – with PCPs (Personal Contract Plans) that are attractive – also takes away disposable income that might have historically been spent in places like this,” he adds. But one of the things that has given Liffey Valley a huge boost is its first Penneys store (the chain is owned by UK-listed firm Associated British Foods, and trades as Primark outside Ireland). Incredibly, the opening in early December of the massive outlet (with 54,000 sq ft of retail space) was the second-busiest opening of any Primark store ever, beaten only by the 2015 opening of the Grand Via Madrid outlet in Spain. 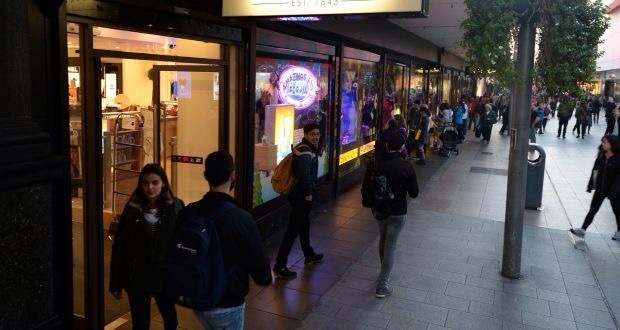 It’s hard to believe that Irish people – with 36 other Penneys outlets already in the country – flocked en masse to the new Liffey Valley shop on a Tuesday morning. O’Connell won’t say how much rent Penneys is paying, but industry insiders reckon it’s probably as high as €1.6m or €1.7m a year. 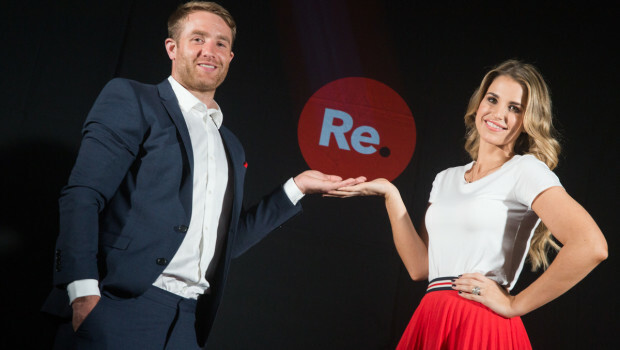 “The Penneys effect was massive for us,” says O’Connell, a former hotelier whose wife, Ingrid Ryan, is the centre manager of the Whitewater shopping centre in Newbridge, Co Kildare (in 2015, she was named All-Ireland Manager of the Year at the prestigious Spectre Awards in London). “We knew it would bring a significant uplift in footfall to the scheme as a whole, but we didn’t anticipate the numbers,” he adds. The Penneys outlet had 18,000 visitors on its opening day, and the centre itself attracted an extra 10,500 shoppers, making for 28,000 that day. One of the reasons it took Penneys so long to arrive at Liffey Valley was the lack of a large space that it could take on. Liffey Valley spent €26m on an upgrade that involved a reconfiguration of the cinema and other works that gave Penneys the kind of space it wanted. 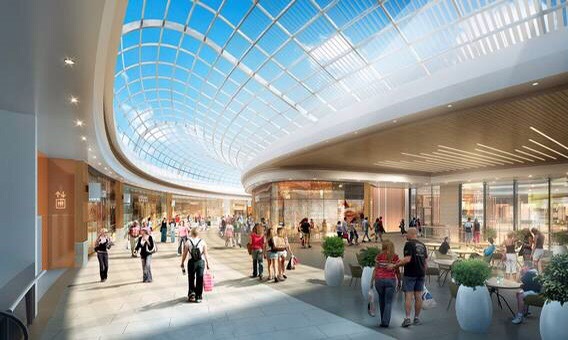 Liffey Valley also has plans for a €150m extension that would increase the size of the centre by about 50pc. It will also see the construction of an Olympic-sized ice-rink and viewing area. That would give it the opportunity to attract retailers it doesn’t have and which want large spaces like those Penneys has. Spain’s Inditex, the owner of Zara, is one of those that O’Connell would like to see with a store in Liffey Valley. Meanwhile, O’Connell says he hasn’t yet met with the new owners of the centre. The investment by BVK’s acquisition was made on its behalf by its investment manager, Universal Investment. Hines is continuing to act as asset and development manager for Liffey Valley. Maybe if the new owners cause any trouble he can just give Conor McGregor a call. 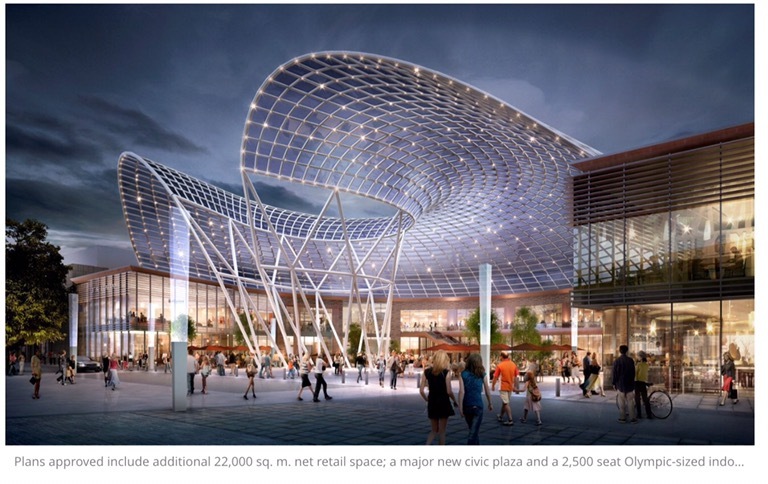 Plans have been approved for a major expansion at Liffey Valley Shopping Centre, which will include another 22,000 square metres of retail space, a major new civic plaza and a 2,500 seat Olympic-sized indoor ice arena. Plans also include a major new public space equivalent to a “typical European-scale urban plaza” and a multi-storey carpark. 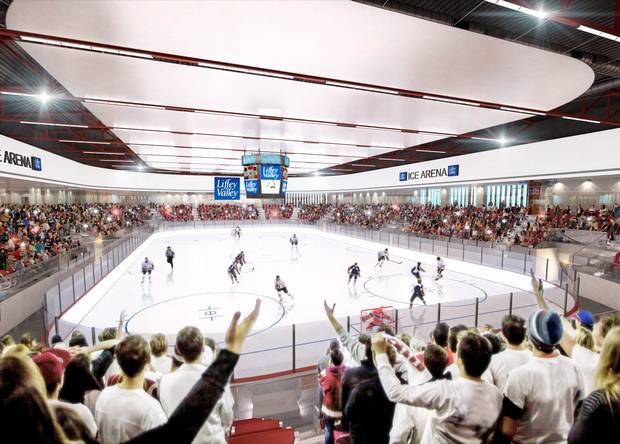 The ice arena is set to have a capacity for 2.500 spectators and will be capable of hosting international ice skating competitions, ice hockey matches and ice entertainment performances. Plans approved include additional 22,000 sq. 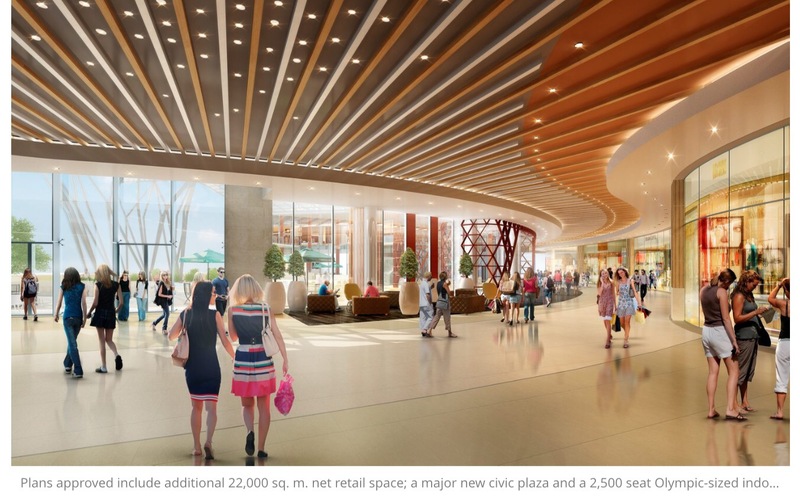 m. net retail space; a major new civic plaza and a 2,500 seat Olympic-sized indoor ice arena. Photographs released today show a large arena with a screen suspended over the ice. Other snaps from inside the centre show shoppers walking across a bright, spacious area with a large plaza outside. The plaza has fountain features and trees positioned around the area, as well as seating areas for coffee shops and bistros. Hines, as asset and development managers, welcomed South Dublin County Council’s decision to grant planning permission for the expansion of the west Dublin shopping centre. Senior Managing Director of Hines Ireland Brian Moran said: “We are absolutely delighted that planning permission has been granted for the expansion of retail space; a major new civic plaza and a 2,500 seat Olympic-sized indoor ice arena. 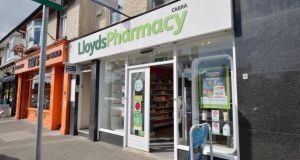 According to the Sunday Times, the US-owned Lloyds Pharmacy group is lining up a €40-€50 million takeover of Sam McAuley Chemists. It is one of the largest independently owned pharmacy groups in the country. The McAuley deal would copperfasten Lloyds’ position as the country’s largest pharmacy chain. The Sunday Times also reports that three directors of Arnotts, including its chairman Nigel Blow, have stepped down from the board. Richard Nesbitt, who was formerly the largest shareholder in Arnotts, and Stephen Haughey, a former chairman of law firm A&L Goodbody, have also left. Accountancy firm Deloitte has , according to the Sunday Independent, has been hit with a “severe reprimand” and €41,000 penalty according to the Chartered Accountants Regulatory Board. It is the first major disciplinary finding against of the “big four” accountancy firms – PwC, Deloitte, EY and KPMG – since the regulator was established in 2007. The Sunday Independent also reports that global commodities company Glencore is considering selling its Limerick zinc mine, Pallas Green, as the company seeks to offload assets and raise cash. According to the Sunday Business Post, the Government will seek to block a legal action for damages against the State by an unsuccessful bidder for its second mobile phone licence, which Denis O’Brien’s Esat Digifone won in 1996. Persona is being supported by British company Harbour Litigation, which will be reimbursed if the case is successful. Baskin-Robbins, the world’s largest chain of ice cream specialty shops, today announced plans to develop restaurants across Northern Ireland and The Republic of Ireland. This effort is part of Dunkin’ Brands’ ongoing strategy to increase its presence across Europe, a key region for the Baskin-Robbins brand, as it continues to grow globally. Baskin-Robbins is looking to recruit qualified, well-capitalised multi-unit licensee groups with deep retail or foodservice operating experience to develop the brand across Ireland in Dublin, Cork, Galway, Waterford/Wexford and Belfast. The brand is seeking two franchise groups to develop five locations in the Republic of Ireland and three shops in Northern Ireland over the next several years, or a single group for the entire territory. Ideal licensee candidates will have strong financial backgrounds, knowledge of their local consumers and a proven track record of success in the restaurant industry. Baskin-Robbins has a strong presence globally, with more than 7,500 Baskin-Robbins locations in nearly 50 countries worldwide. 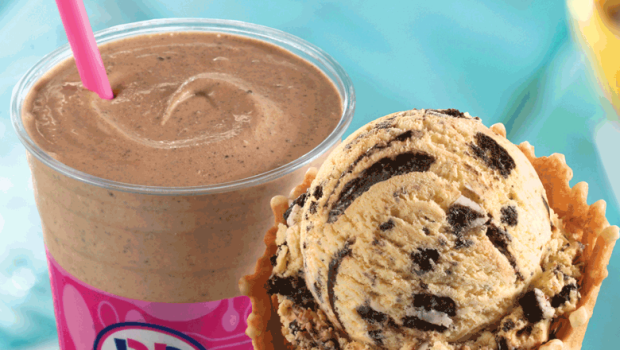 The brand currently has over 500 restaurants across Europe, including more than 140 Baskin-Robbins locations in the United Kingdom. Superdrug is poised to launch international shipping from its ecommerce platform, with Ireland the first country set to benefit from the service. From next Wednesday customers in Ireland will be able to shop online at Superdrug.com and place orders to be delivered directly to their homes or to one of five Superdrug stores in the country. It marks the first time the health and beauty retailer has offered shipping outside the UK. Superdrug dubbed the move the “next step” in its Customer 360 multichannel strategy. It follows last year’s investment into a new ecommerce platform and logistics network. Superdrug said Irish customers will also be able to become members of its rebranded Health & Beautycard, allowing them to qualify for the retailer’s promotions and offers. Superdrug marketing director Matt Walburn said: “While we’ve been serving customers in Ireland through our stores for years we’ve never had the ability to offer delivery or an order-and-collect service. “This move will help us to offer even more customers the best deals and the latest health and beauty products. The sale of shares in Irish service station operator Applegreen has raised €91.7 million in an initial public offering (IPO). Shares in Applegreen began trading on Friday in a move which has snared €70 million for the company and €21.7 million for its selling shareholders, The Irish Times reports. Approximately 24.1 million ordinary shares were placed with investors to start trading on Friday (19 June) on the junior ESM market in Dublin and the AIM in London. The placing, which was priced at €3.80, was made up of 18.4 million new shares and 5.7 million sale shares. Founded and owned by Bob Etchingham and Joe Barrett, Applegreen has said it will use the net proceeds to “accelerate the expansion” of its estate in Ireland and the UK. The company also intends to “upgrade and rebrand a number of existing sites”. 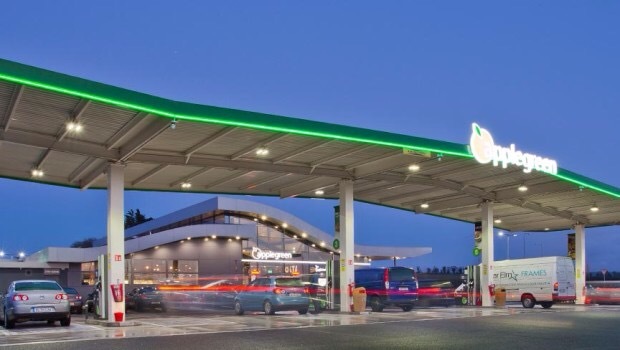 Applegreen currently holds a 12% share of the Irish fuel market and is the number one operator of motorway service stations here. 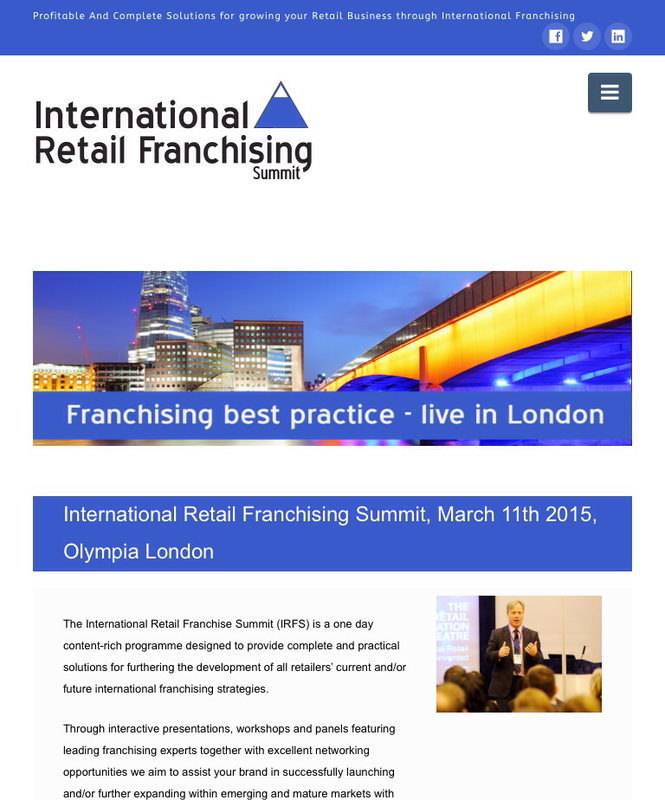 It holds franchises for Subway, Costa Coffee, Burger King and Greggs, among others. Applegreen’s earnings before interest, tax, depreciation and amortisation amounted to €22.8 million on revenues of €973.3 million in 2014. Etchingham and Barrett retain a 69.4% shareholding in Applegreen after the flotation. These shares are held through a company registered in Malta. called B&J Holdings Ltd.
Irish executives subject to the clawback provision include chief operating officer Geoff Byrne, commercial director John Paul O’Reilly, legal director Sarah Gallagher, marketing director Henry Dummer, personnel director Geraldine Casey, corporate affairs director Christine Heffernan, chief financial officer Adrian Lewis and new Tesco Ireland chief executive Andrew Yaxley. The Sunday Independent reports annual cash bonuses can be recouped by Tesco for up to three years after they were first awarded, while long-term share bonuses could potentially be clawed back for up to five years. 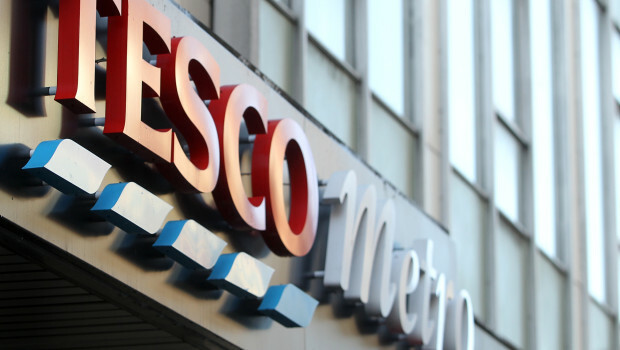 The news comes after Tesco was obliged to pay out upwards of €2m in bonuses to its former group chief executive and group finance director last year. This is despite the fact that the group discovered profits had been overstated by more than €250m. Former group chief executive Philip Clarke received £1.2m for loss of office, while ex-group finance director Laurie McIlwee was paid £970,880. Tesco attempted to withhold these payments while the investigation into the accounting scandal was ongoing. However the supermarket was contractually obliged to pay up unless it could establish that gross misconduct was at play. 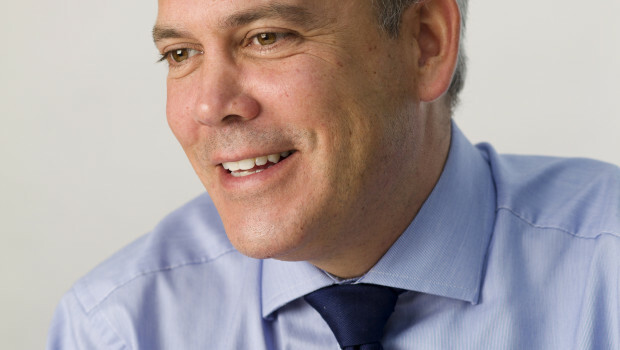 The newspaper also reports that new chief executive Dave Lewis’ annual bonus will be tied to the company’s sales growth, 30% to profit and 20% on the delivery of operational and strategic goals. By contrast, only 18% of Clarke’s yearly bonus was pegged to sales growth. 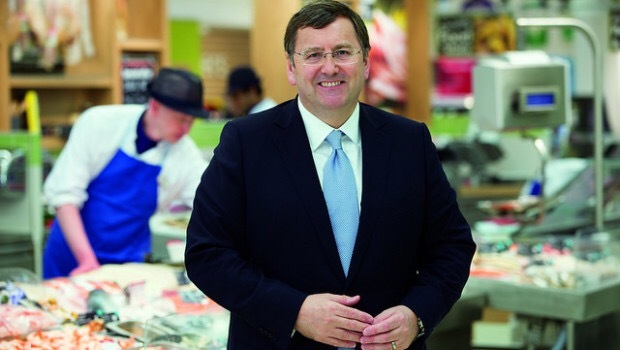 SuperValu has announced that it recorded retail sales of €2.58 billion in 2014. The Musgrave Group says this represents a new milestone for the brand, following the addition of 24 former Superquinn stores to the business in February 2014. As a result, SuperValu now holds 24.9% market share and serves over 2.6 million customers every week. 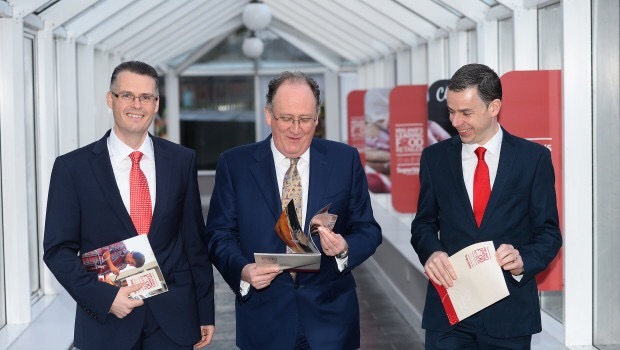 SuperValu plans to invest €18 million in opening four new stores in 2015, which will add 280 jobs to the SuperValu network. Some of the locations will include Athlone and Kilcock. Together with its retail partners, SuperValu employs approximately 14,500 colleagues, making it one of the State’s largest private sector employers. One of the major achievements by SuperValu in 2014 was the establishment of the Food Academy programme, which is a joint initiative between SuperValu, Bord Bia, the Local Enterprise Office Network to support small food companies in Ireland. In total, 200 small food producers supported by the Food Academy will generate sales worth €10 million with SuperValu in 2015. Thirty high performing small food companies have also graduated to Food Academy Advance, the next stage of the programme, to allow them to scale up and secure national listings with SuperValu. US fashion designer Michael Kors is opening a shop in Belfast’s Victoria Square Shopping Centre – just as record-low inflation leaves consumers with more cash to spend. Not since Elvis was in the charts has our disposable income stretched so far, and with the improved spending power comes the prospect of indulging one of our favourite pastimes: shopping. The New York label with a familiar MK monogram has become a popular appendage hanging from fashionistas’ handbags and emblazoned across their wristwatches. The city centre fashion and accessories store will be its second in Ireland, following their debut venture in Dublin. Criona Collins, director of retail at Lambert Smith Hampton, said new investments reflected a wider, upward trend in consumer confidence as well as a vote of confidence in Northern Ireland itself. “After everything we’ve gone through here, in terms of the worst recession and our own internal turmoil in Northern Ireland, we are seeing the first glimmers of hope and retailers being encouraged to invest here,” Ms Collins said. She described the recent investments by the likes of Swarovski jewellers, YO! Sushi restaurant and Goldsmith’s Boutique in Victoria Square as a “reflection of the optimism in the marketplace”. “It’s a really good barometer because two or three years ago we wouldn’t have been in such a comfortable position for them, when there was still too much fragility in the market. “Now that there’s been a period of stability, and with inflation rates remaining low, this is a sign of growing optimism. There’s still a bit of fragility but growth is slow and steady and safe and not spiralling out of control,” she said. Karise Hutchinson, head of the enterprise and business department at the University of Ulster, said shrewd retailers like Michael Kors knew their customers also had high expectations. Belfast FashionWeek director Cathy Martin also welcomed the news of Michael Kors’ impending arrival but said existing suppliers could be affected by the move. 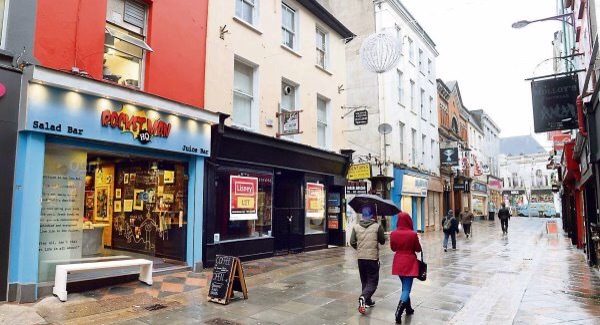 News of Victoria Square’s new tenant comes after shopping footfall here fell 2.4% in January. 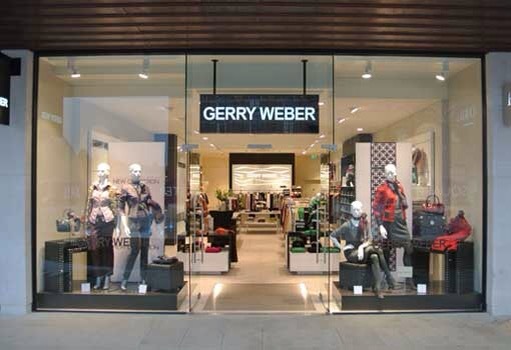 German womenswear brand Gerry Weber has appointed the founder’s son Ralf Weber as its new chief executive. Dunes Stores workers are set to ballot over the coming weeks for industrial action due to issues over their working conditions. 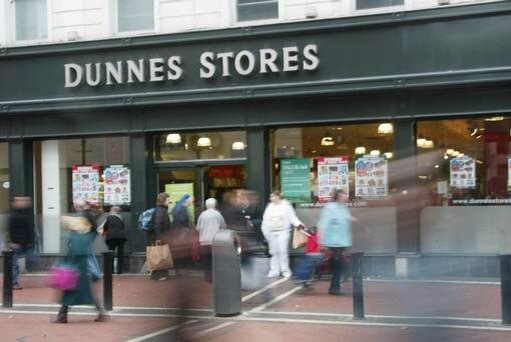 Mandate, the trade union representing 40% of Dunnes 15,000 workers said the balloting process will take place in a few weeks and it will decide whether strike action will prevail. The union said that this action is needed because the company failed to put last year’s Labour Court Recommendations in place, which were that the company would discuss the workers grievances with them. The company has been criticised for using temporary and zero hour contracts and approximately three quarters of staff are on part-time flexible contracts. This leaves employees in an extremely vulnerable position as they cannot predict how much they will earn each month yet they are still expected to be available for work. It also makes it difficult for them to get mortgage or loan approval. Mandate assistant general secretary Gerry Light told the Irish Times: “The combination of low pay and flexible hours means that many Dunnes workers cannot afford to provide a basic standard of living for themselves and their dependents. Many of our members cannot access mortgages or loans because of insecurity of hours due to low-hour contracts. Dunnes workers want to have their right to trade union representation vindicated, particularly when it comes to disciplinaries and collective bargaining. Key to all of this is the fact they don’t feel respected by their employer”. A final decision on strikes will come after all members are polled in the coming weeks. 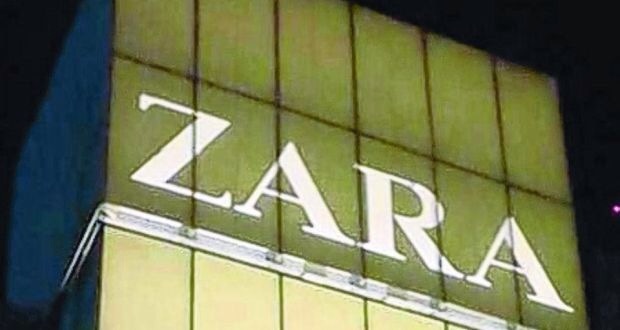 giant that owns the Zara group, says it plans to open more Irish stores when it finds suitable outlets. The group, which has global sales of about €17 billion, recently filed accounts for a number of its Irish operations, including Zara, youth fashion outlets Bershka and Stradivarius, Pull & Bear and the mid-market Massimo Dutti. Inditex’s retail brands here all had flat or slightly lower sales in the year to the end of January, with the cost of store revamps hitting profits. The group says it will open “stores as soon as suitable opportunities arise” to capitalise on the nascent retail recovery. Inditex is known to have retained property consultants to find new locations in Ireland, including Dublin and Cork. Za Clothing, the main Inditex company here that operates the nine Zara stores, had flat revenues in the year of about €56.7 million. Its net profits fell from €5.3 million to just over €3 million. The company, which has 31 Irish staff, paid a €3.3 million dividend to its Spanish parent. Bershka, the youth fashion group that operates four stores in Dublin and one in Cork, accounts for 10 per cent of Inditex’s sales worldwide. Its sales in the year to the end of January slipped by €1 million from €10.2 million, while it more than tripled its Irish losses to €1.2 million. Pull & Bear, Inditex’s brand that operates stores on Henry Street and in Dundrum, held sales at about €5.5 million but made a loss of €776,000. The Stradivarius brand, which operates in Dublin and Newbridge, made a loss of €234,000 from its two stores. Massimo Dutti, which opened a store on Grafton Street in January to add to its Dundrum outlet, increased sales slightly to €4.5 million. Overall, the Inditex group’s Irish retail outlets had combined sales of almost €80 million. Inditex also operates its internet sales operation using an Irish company, ITX Fashion, which handles orders for Europe, Japan and the US. It had revenues of €325 million in the year to the end of January, up from €307 million. The company made a net profit of €45 million, up 10 per cent on the previous year. ITX Fashion, which has 21 staff, has retained earnings of €107 million and is sitting on a cash pile of €88 million. The company, which is owned by the Dutch arm of Inditex, paid about €6.5 million in Irish corporation tax last year. giant Dunnes Stores fell 13pc to £13.8m (€17.6m) last year after a slump in revenues. Accounts just lodged by Dunnes Stores (Bangor) in the UK show the firm sustained the drop in profits as revenues decreased 11pc to £140.52m in the 12 months to the end of February 1 this year. The firm paid dividends of £470,000 last year to Irish-based parent, Dunnes Stores (Henry Street). The firm’s profits narrowed after its gross profit margin last year fell from 38.28pc to 37.84pc. The Newry-registered firm’s revenues are generated in Britain and Northern Ireland with Dunnes operating 34 stores in Britain and Northern Ireland, broken down between 23 in Northern Ireland, six in England and five in Scotland. 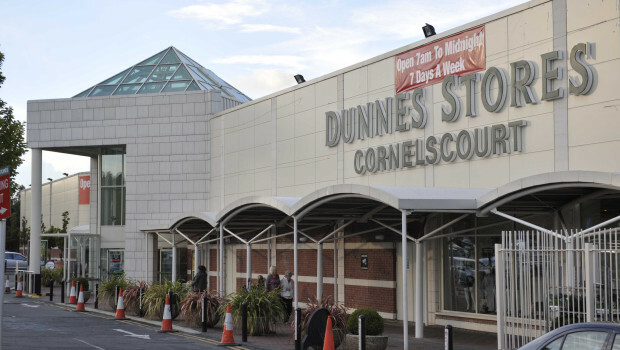 The accounts offer the only insight into the finances of the family-owned business as Dunnes Stores has unlimited status in Ireland and is not required to file annual accounts to the CRO. Numbers employed by the UK arm last year fell from 1,944 to 1,724. 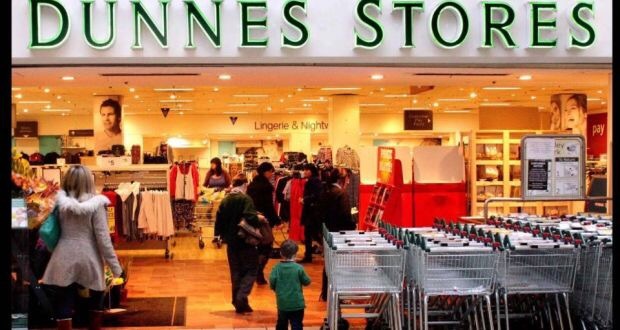 Dunnes Stores is the third largest player in the Irish grocery market with a market share of 22.7pc according to the latest figures from Kantar Worldpanel. The UK firm’s accumulated profits stood at £317m with its cash more than tripling from £28.98m to £104.16m. Staff costs reduced by 7pc from £18.89m to £17.58m. 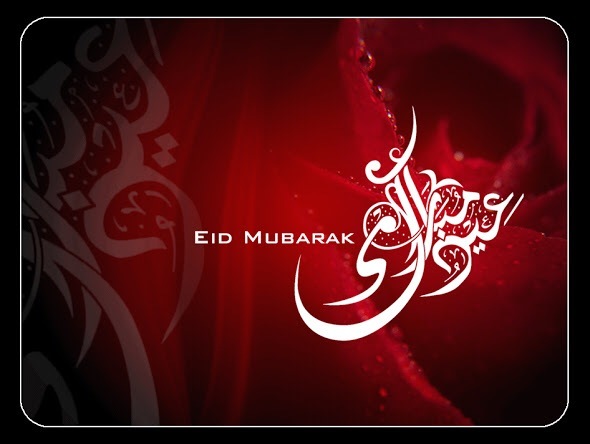 UAE/IRELAND. In major news, Dubai Duty Free’s Executive Vice Chairman Colm McLoughlin has been named a recipient of the Irish Presidential Distinguished Service Awards 2014 for the Irish abroad. The accolade makes him one of a select group of people – and the first Irish person living in the UAE – to be recognised by the Irish government for outstanding contribution to Irish business and communities abroad. The Presidential Distinguished Service Awards were introduced by the Irish government in 2012 with the aim of recognising persons living abroad who have given sustained and distinguished service in key areas such as business, education, community, arts and culture, sport, charitable works and peace. Colm McLoughlin has been nominated in the category of Business and Education, while his support of the Irish community in the UAE is also acknowledged. The ten recipients of the 2014 awards were announced yesterday by Minister for Foreign Affairs, Charlie Flanagan T.D., who is on an official visit to the USA. The Irish President, Michael D. Higgins, will present the ten awardees of the Presidential Distinguished Service Awards at an official ceremony to be held later this month at Aras an Uchtarain, the official presidential residence in Dublin. Colm McLoughlin arrived in Dubai in July 1983 and was part of a ten-man team from Aer Rianta, the Irish airport authority, who established Dubai Duty Free on behalf of the Government of Dubai. 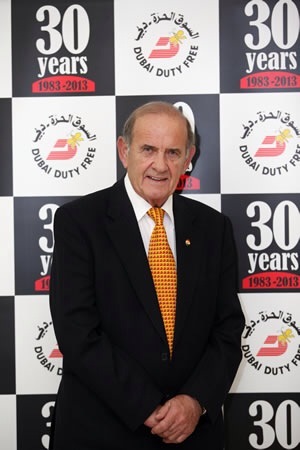 He remained on as head of the operation and has been the driving force behind establishing Dubai Duty Free as a US$1.8 billion business with a global reputation. The Irish Village, which is part of Dubai Duty Free’s leisure division, is also hugely successful and employs 22 Irish staff. Over the past three decades, McLoughlin has been an integral part of the Irish community in the UAE and as a result of his success as a business leader, he has greatly enhanced the reputation of Ireland and the Irish in the UAE. Commenting on the major contribution made by the Irish diaspora over the years, Minister Jimmy Deenihan T.D., the newly appointed Minister for Diaspora Affairs added: “These ten people show the remarkable diversity of Ireland’s reach in the world. For the first time, there are awardees from the UAE, Korea and Russia, in addition to the more expected locations of Britain, the US, Canada and Australia. The Irish Ambassador to the UAE, Patrick Hennessy, said: “I would like to extend my congratulations to Colm McLoughlin, who is the first Irish person in the UAE to receive this Presidential Distinguished Service Award. 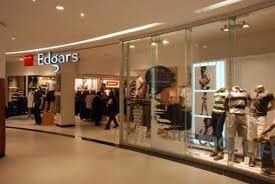 Harare – Listed clothing retailer Edgars Stores Limited (Edgars) is targeting a 193 percent growth in profit to $4, 7 million in the 2014 financial year. The group recorded a $1, 6 million profit in the half year to July. During the six months, its performance was significantly affected by an acute liquidity crisis, sluggish economic growth, company closures and price- based competition in the cash market resulting in the company recording a turnover of $29,5 million, lower than projected. However, the group’s chair Themba Sibanda said they expected the trend to “change by year end as trading has picked up since April and the group expects to see positive bottom line growth for the year”. 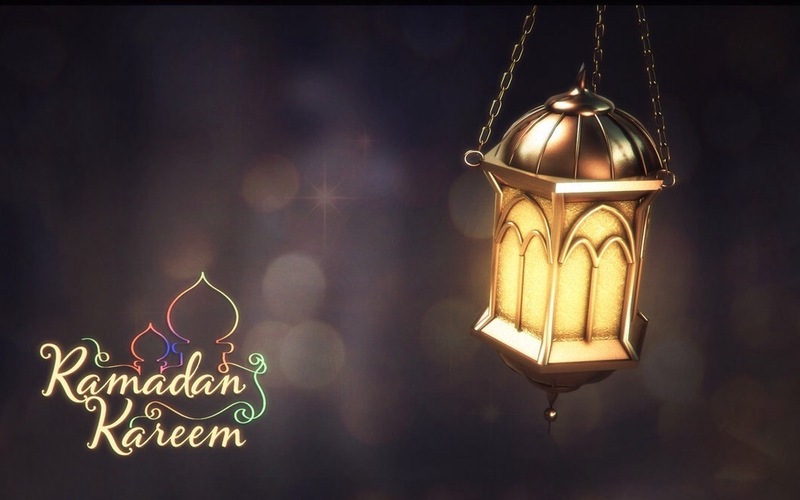 He said they expected to register $70 million turnover in the full year on the back of anticipated increase in demand in the festive season. In the 26 weeks to July, the clothing manufacturer opened two new stores — in Victoria Falls and downtown Harare — bringing the total number of Edgars branches to 28 from 24 in July 2013. UK-listed retailer Poundland is planning to open six new Dealz stores in Ireland over the next year, chief executive Jim McCarthy has told The Irish Times. The new openings will bring to 41 the number of shops in the Republic for Dealz, which opened here three years ago this month with stores in Blanchardstown and Portlaoise. 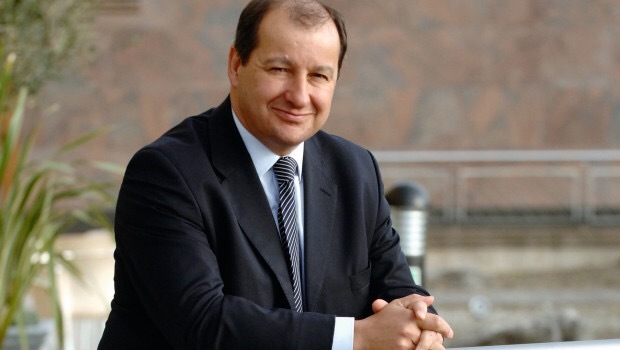 The group’s revenues from the Republic amounted to £55 million for the year to the end of March 2014. Dealz opened its 34th store in Wexford last week with Mr McCarthy reporting that it attracted 3,000 customers on its first day. To date, the UK company has invested €53.6 million in its Irish network with about €4.5 million being spent this year on its expansion. It attracts about 200,000 customers a week to its Irish stores. 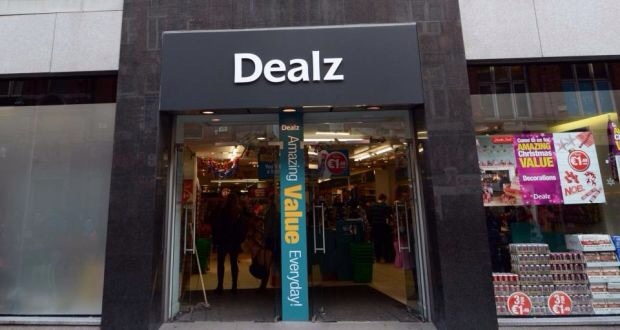 Dealz was a new brand launched here by Poundland, targeted at the value end of the retail market. Most of its products are branded and are sold for €1.49. In the UK, most of its products sell at £1. 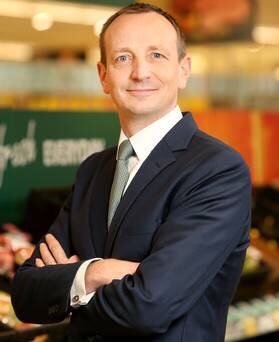 Mr McCarthy said the average spend by Irish shoppers in its Dealz outlets amounts to £6 per transaction. By comparison, UK consumers spend £4.50 on average in Poundland stores. Mr McCarthy acknowledged that there are some “green shoots” of recovery in the Irish economy but doesn’t expect it to hinder the company’s growth. The country’s most successful shopping centre will be put up for sale with a price tag of up to €1bn, sources say, with bids expected from Asian sovereign wealth funds. Bad bank Nama will initiate the sale of Dundrum Town Centre as early as next month, the people said, after it gained full control of the retail hub in April. Nama inherited vast debts attached to it from AIB and Anglo, who loaned hundreds of millions to developer Joe O’Reilly. The 150,000 square foot property will probably sell for around €1bn, property experts predict. A previous valuation of the landmark mall had pegged its worth at closer to €700m prior to a receovery in the market. The shopping centre’s tenants generate a retail income of €50m a year, meaning its new owners can expect a return of around 5pc a year. Opened in 2005, it has an annual footfall of 19m. Just two major retail developments have been sold since the start of the financial crisis. These are Liffey Valley Shopping Centre in west Dublin, which HSBC and international property fund Hines bought a majority stake in earlier this year for €235m, and the Acorn portfolio – consisting of shopping centres in Blackpool, Balbriggan and Clonmel – which was bought for €170m by Minneapolis-based Varde Partners. Several sources said Dundrum will attract a new type of investor to Ireland. “Asian sovereign wealth funds are a real possibility. It will attract a new kind of high-quality buyer, one who maybe hasn’t looked at Ireland previously,” said one. It is understood that Korean investors had been underbidders in the Liffey Valley Shopping centre. Gulf sovereign wealth funds and major pension fund investors are also thought to have run the rule over the centre in the last two years. Because of its size, Dundrum Town Centre rivals Dublin city centre as a retail hub. Despite the economic downturn it rarely sees a vacant unit and tenants range from luxury retailers such as Harvey Nichols and BT2 to Tesco, HMV and Penneys. One insider said they would be “highly surprised” if Joe O’Reilly’s Chartered Land does not bid for the asset as part of a combination of investors. The developer may have lost control of Dundrum but is still highly active in the retail sector. Chartered Land declined to comment. 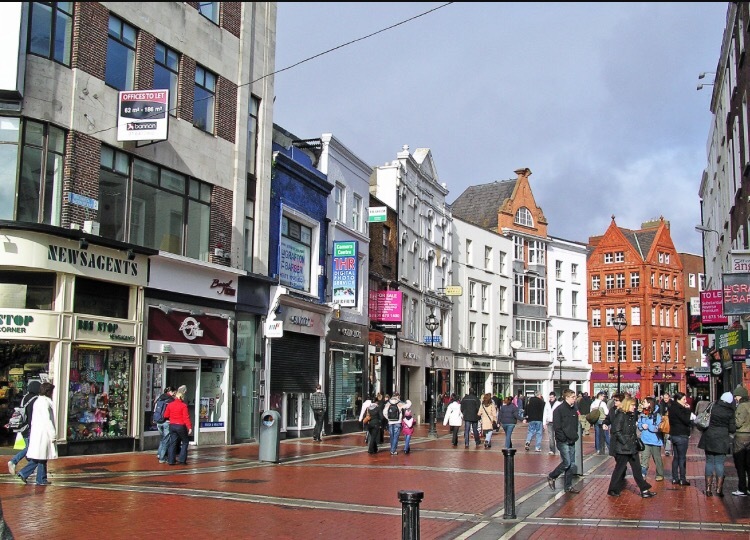 The firm has secured planning permission to develop a major shopping centre in the Moore Street area of Dublin 1. O’Reilly was also behind the development of the Swords Pavilion and ILAC shopping centre in Dublin. There has been some internal movement at Chartered Land of late. 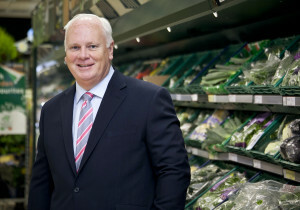 Chief executive Dominic Deeny left earlier this summer for a position with Dunnes. He was replaced by Andrew Gunne, the former managing director of Key Capital Real Estate. Dundrum won’t be the first retail hub Nama puts up for sale this year. It recently started the sale process for a portfolio of five shopping centres, valued at €100m. This includes Carrickmines retail park, the vast south Dublin site home to Harvey Norman, PC World and Halfords. RETAILER the Barry Group is opening 35 new stores. The openings, to be completed by the end of this year, will create around 300 jobs. The Mallow-based retail group, which owns the Costcutter chain of convenience stores and Carry Out off-licence brand, said consumer spending is in recovery mode. Some 20 of its 35 new openings are Costcutter stores. Ten have already been opened, including outlets at Spiddal in Galway, Clonskeagh in Dublin, Monaghan town and Allenwood in Kildare. The remaining 15 openings are Carry Out off-licences. All new stores will be operated as franchises. The Barry Group is benefiting from dramatic changes in shopping habits post-recession. Convenience chains, budget stores and German discounters Lidl and Aldi have all gained ground at the expense of traditional supermarket giants like Tesco and Dunnes. Costcutter expanded its generic range to target thrifty consumers. The downside, for the retail group, was fierce price competition. September figures from the Central Statistics Office showed food and drink prices rose at their slowest level since March 2012. Grocery price inflation was 1.5pc, down from 1.9pc in the three months before. “Managing director Jim Barry has made huge structural changes at the group in the last 15 years, from buying to marketing to how we manage sales. 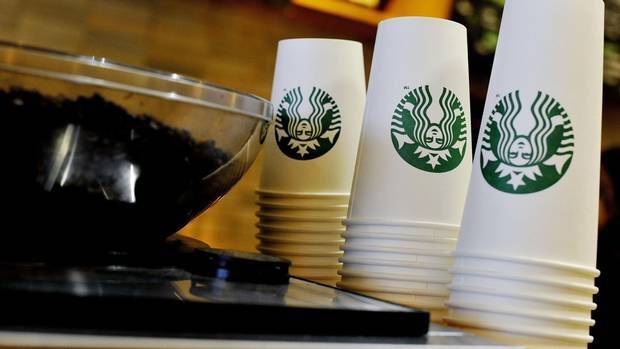 That has started to come to fruition,” said Barry Group head of sales Paul Roche. The group is also benefiting from growing interest in community-based retailing, he said. Many of its stores are located in rural locations and run as franchises by members of small and rural communities, which consumers increasingly prefer for ethical reasons, he added. 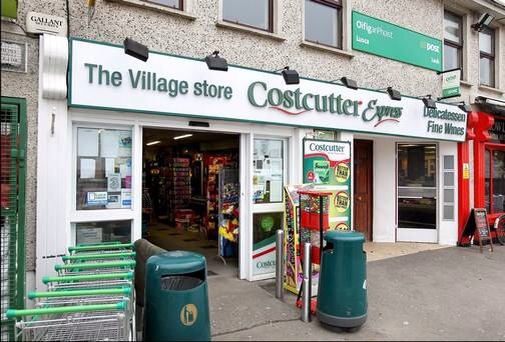 One new Costcutter store, in Monaghan, will invest 100pc of its profits in community projects. 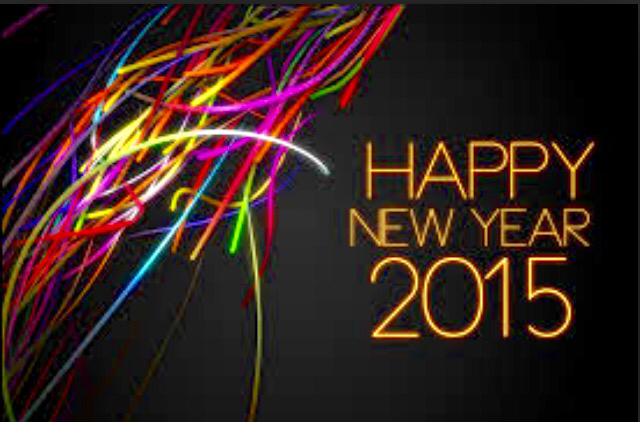 The Barry Group has operated for 60 years. It owns the Quik Pick retail franchise alongside Costcutter and Carry Out. It also operates wholesale food and alcohol networks. It recently invested €1m in a centralised chilled distribution solution, which is expected to add up to €200m in revenues over five years.